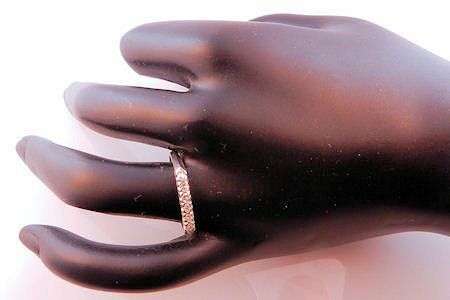 Description: A vintage platinum .15cttw diamond wedding or anniversary band. Containing 6) .025 carat single cut diamond accents in fishtail style settings. The diamonds are at least VS in clarity, G in color. Stamped 10% irid plat. Circa 1940's. Weighs 3.1 grams. 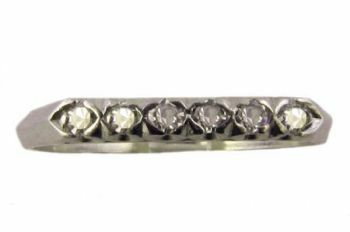 Measurements: The band measures 2.5mm in width tapering down to 1.5mm at the bottom by 2.7 in height. Ring size 9. 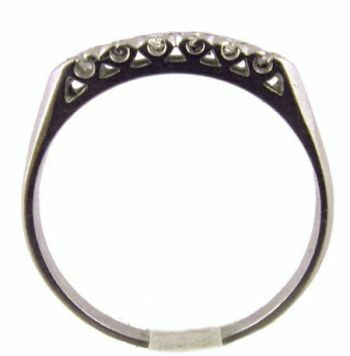 Resizing is only recommended to up or down 1 ring size. Shipping time: Within 1 to 2 days or up to an additional week if resizing is requested.